Reimbursement forms are available. Forms are due by December 7th. Surveys for Attendees and Sponsors are open until December 14th. Job Dekker and his group study how genomes are folded in three dimensions. He has invented the chromosome conformation capture (3C) technology and since then has pioneered development and application of a series of molecular, genomic and computational approaches to map and analyze the three-dimensional folding of genomes at Kb resolution. His work had led to new insights into the internal organization of chromatin fibers, the formation of chromatin looping interactions involved in long-range gene regulation, the organization of the interphase nucleus, the structure of metaphase chromosomes, and the general folding principles of complete genomes. The Fox laboratory, in collaboration with my colleague Dr. Jon Bjarnason, was one of the first to identify and characterize the metalloproteinases present in numerous snake venoms. These Snake Venom Metalloproteinases; SVMPs are responsible for many of the pathologies associated with snake envenoming. Our research has elucidated the structures of these toxins and identified the biochemical and cellular mechanisms by which the toxins function to give rise to their noted pathologies. Specifically my research interests have been centered on metalloproteinases and extracellular matrix and the processes they regulate in normal and pathological circumstances. Our recent focus has expanded to include the interaction of host and tumor in carcinogenesis and metastasis and the role of stromal microenvironment, inflammation in cancer metastasis and invasion. We are also carrying out research on the discovery and validation of biomarkers associated with normal and chronic wound healing. Our longstanding interest in snake venom toxinology continues with studies aimed at elucidating novel molecular mechanisms associated with venom induced wound morbidity. We also are working on the identification of novel therapeutics from natural product libraries. Title: Coupling Biophysical Approaches with Molecular Simulations to Optimize Compounds for Challenging Disease Targets"
Dr. Woody Sherman is CSO at Silicon Therapeutics, an integrated drug discovery company focusing on challenging disease targets, where they have developed a platform based on quantum mechanics and molecular simulations coupled with biophysics and other experimental approaches. Dr. Sherman joins Silicon from Schrödinger, a leader in computational chemistry software development, where he was vice president and global head of the Applications Science team, helping pharmaceutical companies apply computational chemistry tools to challenging targets. Dr. Sherman is a leader in molecular simulations and computer-aided drug design, with over 75 publications covering novel methods and applications. He completed his Ph.D. at MIT with Professor Bruce Tidor, PhD, where he examined the role of electrostatics and dynamics in protein-ligand binding, and developed a novel method for optimizing ligand binding specificity across a panel of (desirable and undesirable) targets. Dr. Sherman has published on a broad range of topics, including free energy simulations, molecular dynamics, induced-fit docking, virtual screening, lead optimization, selectivity design, cheminformatics, and protein design. He is on the Editorial Board of Chemical Biology & Drug Design and the Journal of Chemical Information and Modeling. Breakout sessions in Flow Cytometry, Mass Spectrometry, Genomics, and Administration will focus on best practices, emerging technologies, and building sustainable partnerships internal or with industry. 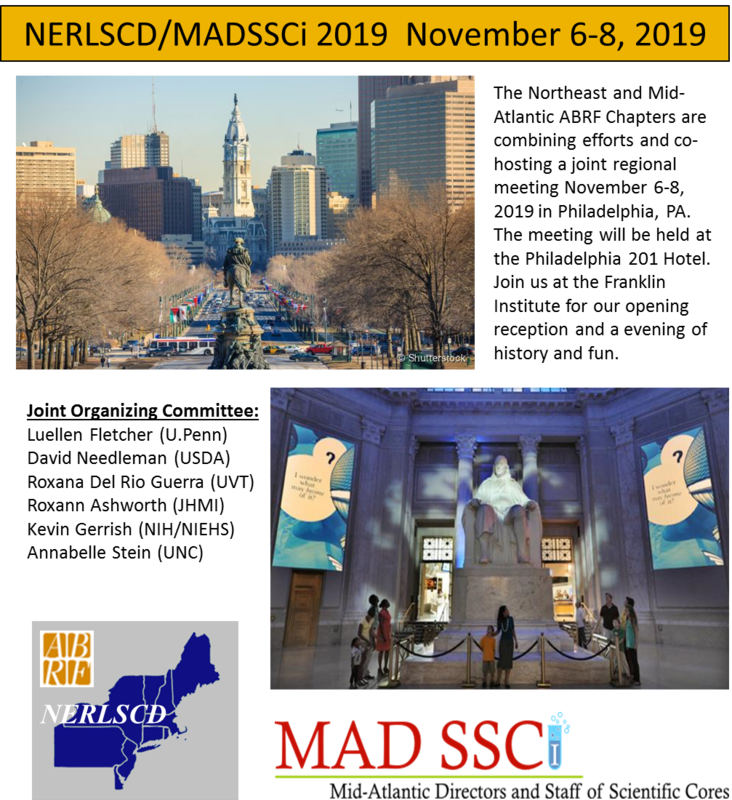 We will be hosting several workshops prior to the main conference including the Northern New England Microbiome Association Meeting, New York Regional Core Administrators Network gathering, tours of the Institute for Applied Life Sciences 30+ Core facilities, and a special Career Development workshop for graduate students looking to learn more about careers in core facilities and industry. Additionally, our Platinum Plus vendor sponsors will be hosting workshops prior to the conference. NERLSCD is a regional Chapter of the international Association of Biomolecular Resource Facilities (ABRF).